Running on Empty is the fifth album by American singer-songwriter Jackson Browne. Featuring songs themed around life on the road, the entire album was recorded on tour, either live on stage, or in locations associated with touring, such as backstage, on tour busses, or in hotel rooms. Released in 1977, the album reached #3 on the Billboard Pop Albums chart in 1978 and stayed on the charts for 65 weeks. The single for the title track, "Running on Empty", peaked at #11 and the follow-up single, "The Load-Out"/"Stay", reached #20 on the Billboard Pop Singles chart. The album received two Grammy Award nominations in 1979: one for Album of the Year and the other for Pop Male Vocal Performance for the song "Running on Empty". In addition to tracks recorded on-stage during concerts, it also contains songs recorded in hotel rooms, on the tour bus, and backstage. It is unusual among live albums in that none of the tracks had ever appeared on a previous studio album. Browne was the sole writer on only two songs, co-writing four others and covering another four. The theme of the album was life on the road. In a Rolling Stone interview about the tour during which the album was recorded, Browne expressed pleasure at finally being able to afford the session musicians he wanted to go out on the road with him. The album was certified as a Gold record in 1977 and Platinum in 1978 by the RIAA. It reached Multi-platinum in 1997 and 2001. It reached 7X platinum and is Browne's best-selling album to date. In popular culture, the album cover can be seen framed and hanging on the wall next to the front door in the apartment on the set of Mork & Mindy. 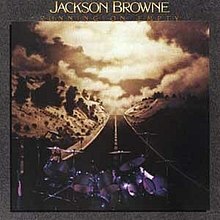 The original Rolling Stone review in 1978 by music critic Paul Nelson praised the album, writing "What I really like about Running on Empty probably has little to do with the generosity or genius of its dual concepts, with the songwriter's craftmanship skill, with how much I admire the music of David Lindley and the Section, but rather with Jackson Browne himself. In other words, as impressed as I am with Jackson Browne's art, I'm even more impressed with the humanity that shines through it. Maybe they're inseparable, but I doubt it." In his retrospective review for Allmusic William Ruhlmann called the album "Browne's least ambitious, but perhaps most accessible, the album ironically became his biggest seller. But it is not characteristic of his other work: for many, it will be the only Browne album they will want to own, just as others always will regard it disdainfully as 'Jackson Browne lite'." Music critic Robert Christgau gave the album a B+ grade: "Jackson sounds relaxed verbally, vocally, even instrumentally... I consider this his most attractive album. But his devotees may consider the self-effacement a deprivation." Blender gave the 2005 reissue a 4 of 5 star rating, stating it "cuts deeper than most road sagas partly because Browne had the brilliant notion of recording on the fly... It also works because he tapped the culture’s circa-1977 sense that it was running on empty, feeling like a trashed Holiday Inn room—Empty is about something larger than the misery of room service." Bill Shapiro called the album "Audio verité—one of the most conceptually fascinating recordings in the history of rock & roll." In 2004, in The 100 Best-Selling Albums of the 70's, Hamish Camp wrote: "Entering somewhat of a creative lull following some sterling albums... Running On Empty was regarded by many as lacking ambition but was nevertheless Browne's most commercially successful of his career to date, peaking at Number Three in the US and reaching Number 28 in the UK." At that time, it was the twenty-third best-selling album of the 1970s. Running on Empty has been reissued numerous times on CD. On November 15, 2005, Elektra/Rhino issued a remastered version with the following additional tracks: 11. "Cocaine Again" and 12. "Edwardsville Room 124" on Disc 2 of the package, which is a DVD Audio version of the album's track lineup that features a 5.1 surround sound mix, among other bonus items, such as video montages and lyrics. Disc 1 is a remaster of the original album's song list only. The remaster is missing the first 25 seconds of audience ambience that, on all other previous editions of the album, led into the beginning of the album's title track. For reasons unknown, this snippet, which included the sounds of the musicians' count into the song's opening, was edited out on this version, though curiously the Disc 2 DVD Audio version includes the 25 seconds missing on Disc 1. Doug Haywood and tour photographer Joel Bernstein sing harmony. Russ Kunkel is credited as playing "snare, hi-hat, and cardboard box with foot pedal." The song was recorded aboard the band's Continental Silver Eagle tour bus (hence the lyrical reference to "Silver Eagle") while en route from Portland, Maine to their next gig in New Jersey. The bus's engine is audible in the background throughout, and its downshift and acceleration can be plainly heard during the bridge. David Lindley and Rosemary Butler share lead vocals with Browne. Rosemary Butler – background vocals, co-lead vocal on "Stay"
David Lindley – lap steel guitar, fiddle, co-lead vocal on "Stay"
Recording in Hotel and Bus on Record Plant NY Remote Truck. Assistant Engineers – David Hewitt, Norman Mershon and Mark Salwasser (bus and hotel recordings); Russell Schmitt and Tom Walsh (stage recordings). Mixed at The Sound Factory (Hollywood, CA). Mastered by Bernie Grundman at A&M Studios (Hollywood, CA). Photography – Joel Bernstein (tour) and Aaron Rapaport (other). ^ a b Ruhlmann, William. "Running on Empty > Review". Allmusic. Retrieved June 14, 2010. ^ a b Christgau, Robert (1981). "Consumer Guide '70s: B". Christgau's Record Guide: Rock Albums of the Seventies. Ticknor & Fields. ISBN 089919026X. Retrieved February 22, 2019 – via robertchristgau.com. ^ a b Nelson, Paul (March 1978). "Running on Empty > Review". Rolling Stone. ^ Shapiro, Bill (1991). Rock & Roll Review: A Guide to Good Rock on CD. ^ Camp, Hamish (2004). The 101 Best-Selling Albums of the 70s. ^ "Canadian album certifications – Jackson Browne – Running on empty". Music Canada. ^ "Gold-/Platin-Datenbank (Jackson Browne; 'Running on empty')" (in German). Bundesverband Musikindustrie. ^ "British album certifications – Jackson Browne – Running on empty". British Phonographic Industry. Select albums in the Format field. Select Gold in the Certification field. Type Running on empty in the "Search BPI Awards" field and then press Enter. ^ "American album certifications – Jackson Browne – Running on empty". Recording Industry Association of America. If necessary, click Advanced, then click Format, then select Album, then click SEARCH.